One of the nicest places to be in the Dominican capital of Santa Domingo is the tiled open square Plaza Espana (Plaza of Spain) on the Ozama River. 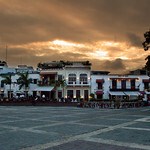 Surrounded by historic colonial buildings and dotted with pleasant outdoor cafes, the plaza is a favored hangout for locals and visitors alike. Situated at the end of the attractive Calle de las Damas (Ladies Street), Plaza Espana is the heart of Santo Domingo’s Zona Colonial (colonial zone). A section of the original city wall runs along the eastern edge, as does the Parque Archeologico la Ceiba with the excavated foundations of the colonial fort. At the southern end of the plaza are two iconic monuments of colonial Santo Domingo, Casas Reales (the royal houses) and the Alcazar de Colon (Columbus palace). The Casas Reales, now a museum, was built beginning in 1503 as the royal court of the Spanish New World. One of the first governors of Santo Domingo, Diego Colon (son of the explorer), built his imposing palace opposite the administrative center. It exhibits colonial furniture and artifacts. Other sights in Plaza Espana include the winding colonial storefronts, Las Atarazanas, and the Museo de las Atarazanas, which houses booty from a sixteenth-century Spanish wreck. Nearby is the Centro de Arte y Cultura Popular, a center of art and culture which pieces from Taino Indian times and Dominican folk art. The beautiful Plaza Espana in Santo Domingo. 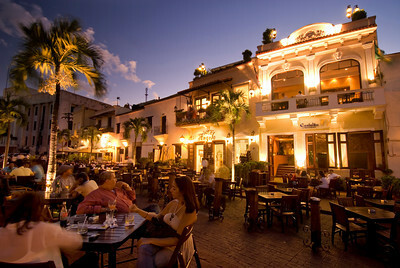 Enjoying a drink in the Plaza Espana, Santo Domingo.